The Special Interest Publications by Better Homes & Gardens are one of my all time favorite go to resources for DIY ideas. Today, I thought I’d pass along some of the ideas from my inspiration files that I think are completely fabulous. 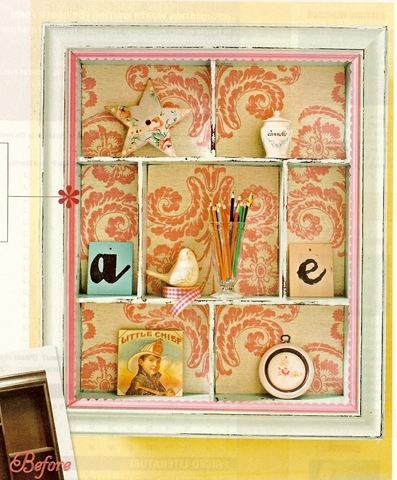 How cool is this idea to wallpaper the drawers of a dresser with a little decoupage ? 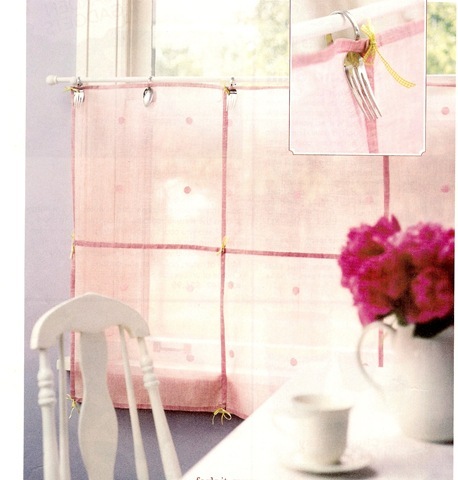 Sew a half dozen sheer napkins together for a cafe curtain, and add charm with mismatched flatware as curtain hooks ! Add a pop of color to your pantry by sewing kitchen towels into basket liners. 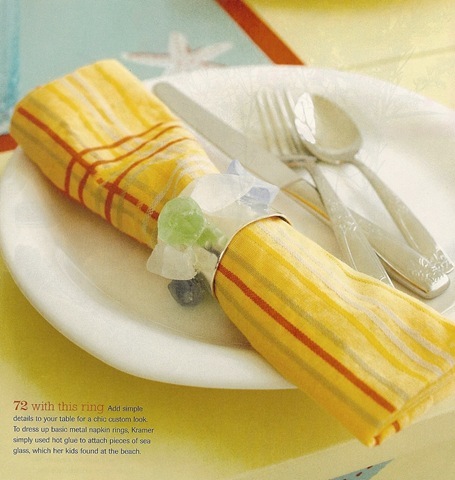 Jazz up your summer table by hot gluing decorative items like sea glass (or vintage buttons, glass gems, etc.) to plain napkin rings. Transform the drab into the fab by backing an ordinary bookshelf with wallpaper and replacing the wood shelves with glass. Très chic ! 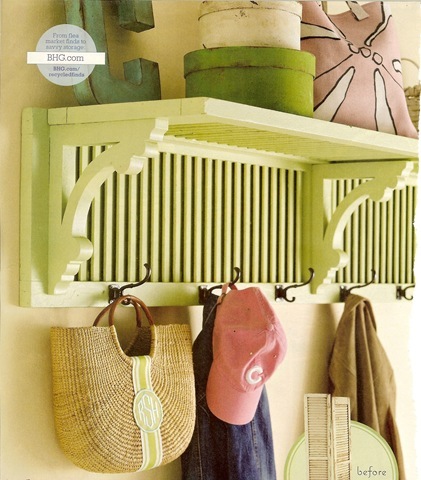 Refashion a shutter and some brackets into a one-of-a-kind shelf and coat rack for your entry. 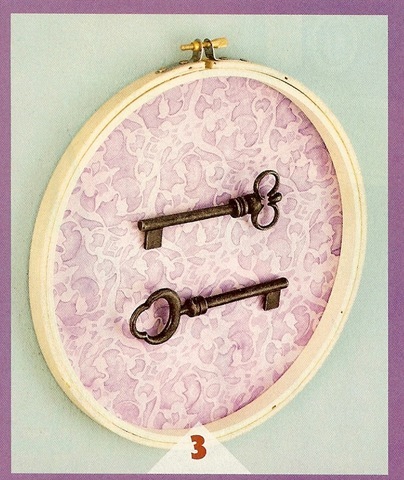 Add vintage charm with skeleton keys mounted to an embroidery hoop backed with scrap paper or wallpaper remnants. Very creative ! Float stock cabinets off the wall, remove two doors, then add a pop of color to the remaining door fronts. 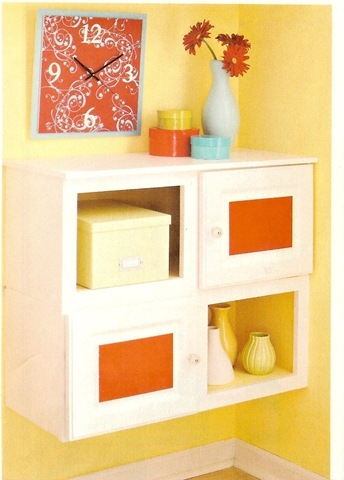 I love the crafty clock made out of foam core, paper secured with spray adhesive, chipboard numbers and an clock making kit. So fun ! Got a great vintage piece of cloth but you’ll never wear the outdated piece ? Refashion it into shams and an accent pillow. Brilliant ! 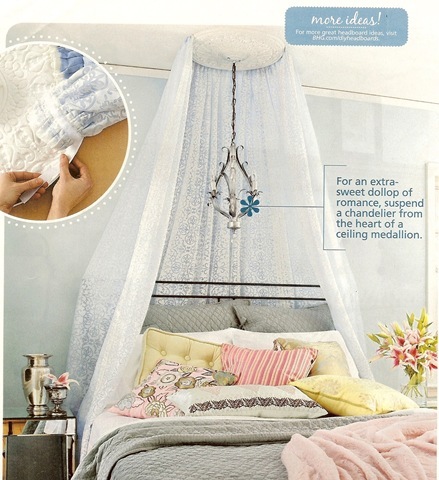 Create a sheer canopy with panels and a ceiling medallion centered above a bed. Use garden hanging baskets mounted low in a kid’s room to corral toys and books. Be sure to secure to your wall studs ! 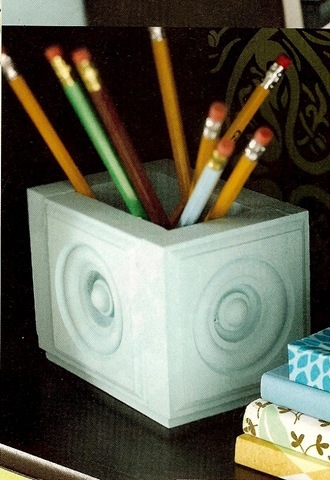 Build a unique pencil holder out of rosettes from the lumber department ! Or how about this – fill a pair of them with sand, top it with another rosette, and you’d have a perfect set of original bookends. 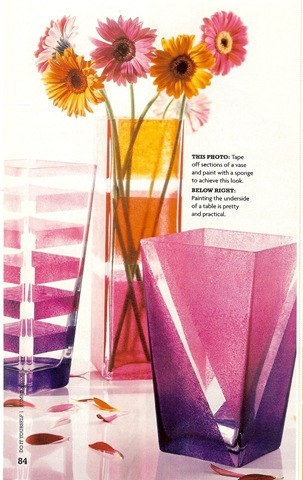 Add interest to a plain vase by using painter’s tape to create your design, then sponging on some colored glass paint. Convert an old fashioned end table into a modern file cart and tool storing station. This is genius ! 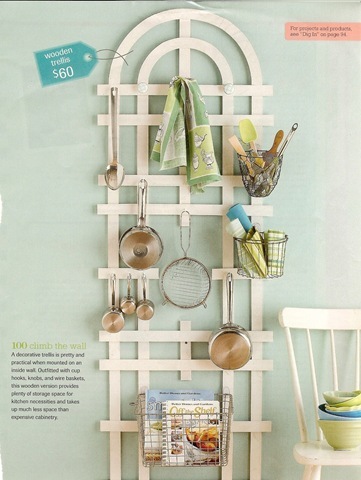 Add a touch of garden themed whimsy to your kitchen by bringing in a trellis and displaying your kitchen utensils. Another plain shelf is given new life with fresh paint, contrasting scalloped molding, and decorative paper secured to the back. You can spot the ‘Before’ in the bottom corner. 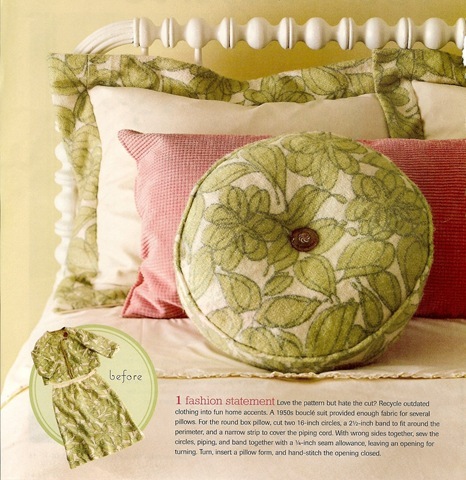 All images courtesy of Better Homes & Gardens Special Interest Publications. Aren’t these the most fabulous ideas ? Which one is your favorite ? I’m giggling here, because I think our inspiration files must be quite similar! I love them all, but the redone shelf in the last picture is waaay cool. Thanks for sharing! I love those publications as well.. my reading basket is full of them! Lots of fun ideas that you posted, but right at this moment I’m liking the planter baskets to use in my entry! I love the planter backets on the kids walls! I am not a big fan of the hammock method for storing all the “stuffies” ( stuffed animals ) that she has, so this will be great! the office on wheels! i NEED one! Eeek! I love the idea about the planter baskets on a kid’s room wall!! So clever! I was wondering if you could share which publication it was in. I have several and saw the first one in your post on a card for subscribing to Do it Yourself but the actual mag was 100 best decorating ideas so I had no idea where to look for that back issue! Excellent post! Love your blog! I love the garden baskets for the kids toys. I am going to have to try that! Ooo! I have a lot of these images in my own DIY file! Thanks for sharing! I love those special publications! I think we’ve read the same ones because I recognize just about all of those projects. My favorite is the shutter shelf and the office on wheels. If I knew how to sew I’d make pillows out of some of my grandma’s vintage clothing. I love those publications too. I have seen most of these ideas, but not that canopy–that is amazing. I need to do this to my little girl’s room. Thanks for sharing. Those are great! I’ve saved a few to my own inspiration files… especially love that shutter shelf and the planters as baskets on the wall. Wheeeee!! I am dizzy with glee over these. I love love love the shutter shelf. I always see these dated 70’s shutters at my favorite antique mall, now I actually have a reason to buy them! So loving the Inspiration File! I, also, love the planter baskets! What a great way to store kids stuff! I love the shutters made into a shelf with the addition of some brackets. I could do that – I just might, if I ever find some shutters. Definitely an idea to store away. Thank you! I love most of these ideas! Especially the shutter shelf! thank you! I’m with the others, I love the planter baskets for kids toys! I’ve seen something similar, also in a BHG special interest where they used a small window box in an office/studio to hold canvases. I LOVE the hanging garden baskets! So many uses and cute half-round shape. Hmmmm, I’ll have to think where I can use them! These are great ideas. I liked the suggestion of repainting a shelf, removing the wood plank and replacing it with glass and a little wallpaper for the backing to boot-so pretty! I have a small shelf like that in our den that would benefit from that treatment. 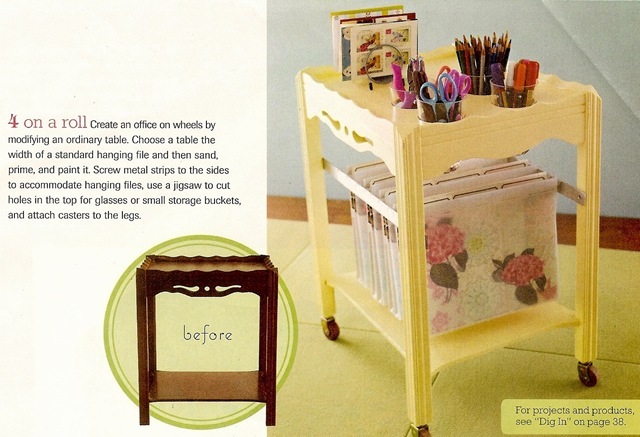 Absolutely love the end table transformed into a rolling cart! I could definitely use something like this. I get BH&G and it is one of my favorites. I also get SL. Both are excellent magazines. I happen to have a sectioned wooden box thingie (it was actually the packaging for my daughter’s play kitchen accesories set- pots, pans, dishes etc) that I haven’t thrown away but haven’t figured out what to do with yet. I think it would look remarkably similar to that last shelf- thanks for the inspiration! BTW- I have a few projects in mind that I’d like to tackle using wallpaper. Do you have any favorite places (online or brick and mortar?) to buy great wallpaper without spending a fortune? Thanks! Oh I love the planter baskets on the walls…I am thinking I could use the wooden rectangular window boxes on the wall for books in our playroom! I have a huge binder full of inspiration that I haven’t look at in awhile, off to check it out. Wallpaper = god’s gift to DIYers. I love that stuff. :) Now the hanging planters… THAT’S a little slice of brilliant right there. I’m all over that like white on rice. Take it one step further and line them with cute fabric that coordinates with the room, so the barbie shoes and legos don’t fall out onto the floor! I love all of those. I actually bought a cheap-o (I think it was “camp rock”) little shadow box on clearance a long time ago, covered the picture with nice scrapbook fabric, then put some skeleton keys in that. I love the look with the embroidery hoops. Awesome inspiration. 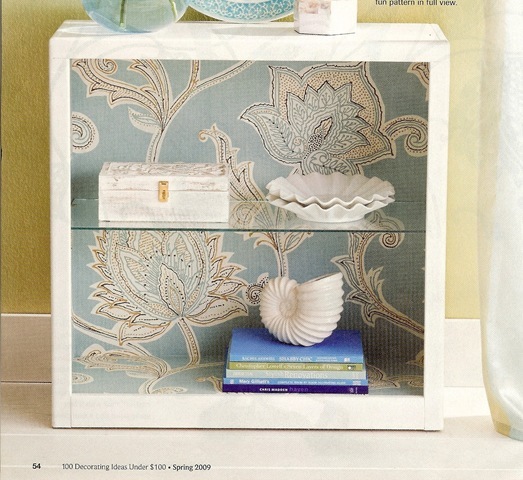 How funny, I was just looking at that first dresser yesterday when I was going through some older magazines. I also love the kitchen towel liners and the hanging baskets. Great ideas! I love the BHG special publications issues too! I always look at some of the great ideas and think “Now, why didn’t I think of that”? I love the planter idea for the kids rooms and that kitchen trellis is so pretty! Thanks! So fun! I love their issues too. LOVE that cafe curtain with the forks and spoons. Looks a bit like my curtain and chandelier that I redid for our kitchen. Pics on m blog. I love the planter baskets and the office on wheels…which issue are these ideas from??? LOVE LOVE LOVE the shutter shelf and I also love the canopy. Thanks for sharing! What great ideas! I think I could even handle a few of them. Thanks for the inspiration. Those are great ideas. I especially love the plant baskets in the kids room. Too cute! these are all fabulous ideas! thank you so much for sharing! Is there a shopping guide/source for those hanging planters? I have been looking for something JUST like that, but with little success. They are so simple and just what I need, and I see the $14 price tag in the corner…where are they from??? Thanks!!! 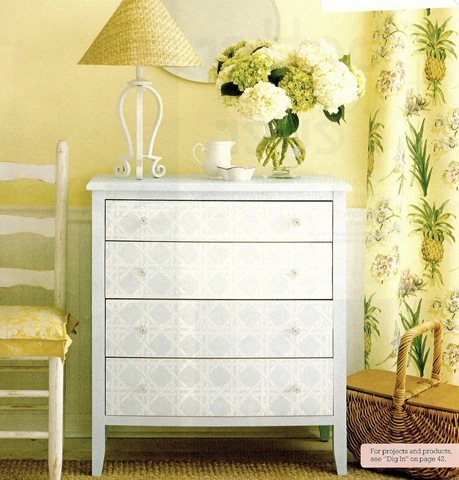 I love the cane decoupaged dresser the best…fab ideas! And the rosettes pen holder…amazing…so cool to have a desk decor that looks like an architectural element. Leslie, these ideas are from the following issues: 100 Decorating Ideas under $100, Summer 2009; 100 Ideas Makeover Style, Fall/Winter 2009; DIY Summer 2008; 100 Decorating Ideas under $100, Spring 2009. LOVE these magazines ! Maureen – send me pics and I’ll send YOU ideas ! My favorite is the shutter shelf! Lots of inspiration…thanks! Just recently found your blog and I just absolutely love everything about it!!! LOVE these inspirational photos! 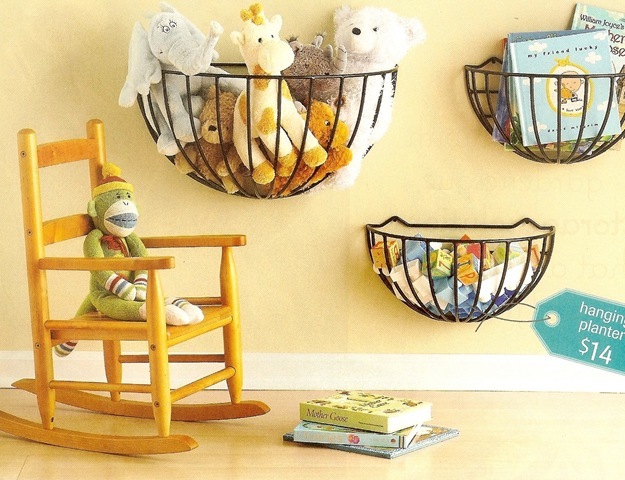 I could totally see mysef using every one of them but my favorite is the hanging garden baskets for kids toys! What a great idea! That cafe curtain is to DIE for!!! I just love it!!! Hi Kate, these are all fantastic ideas, but the garden baskets for toy storage is awesome! wow, those are all fantastic!! I love all these ideas. 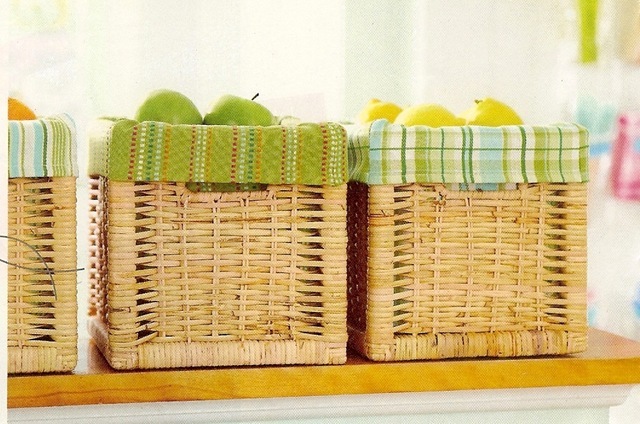 The wire baskets – genius! The shutters for a shelf and hanging – wow! Napkin rings – making tomorrow with all that beach glass the kids brought home. The re-purposed dress to pillows – now I can finally clean out the bin of “what do I do with this stuff that is old but I can’t wear” – YAHOO!!! Love BH&G. :) I like the embroidery hoop and keys best! Oh my gosh, more than anything those photos make me want summer summer summer! Thanks for sharing these fun ideas. I keep a stack of those idea-filled gems with many dog-eared corners. I have grand plans to undertake many of the projects. Someday. My favorites were the last (shelf redo – fabulous!) and the baskets for corralling toys. love the garden holders on the wall of the kids room. that is a great idea. Very Nice.Off to the stores I go. We can’t afford magazine subs right now so I wanted to thank you for a peek at the goodies in this one. As I was scrolling down, I let out a resounding “HA! I’VE ALREADY DONE THAT!” The hubster was thrilled that it was something we already had instead of something new I wanted to try…heehee! After 2 years of holding up morning glories, I yanked our old falling apart trellis insided, gave her a good clean up, glued all of the wobbly parts and painted her up pretty. She’s been the focal point of my kitchen ever since! She’s sooooo puuuuurty with fake ivy vines twising around and teeny tiny sauce pans culled from Grandma’s basement hanging all over. I plopped some S hooks here and there and hang herbs to dry on her as well! I had doubts about this project when I first started it 4 years ago but how cool is it that we’ve got the seal of approval now!?! Thanks again! I LOVE the rolling cart! Can you please share the name and date of the magazine that photo came out of? These are totally awesome and lovely ideas, but I always feel like they don’t apply to my (ugh rental suite) home. Mostly I get perplexed by what to do in the kitchen (especially with storage), the bathroom (it’s very white, while only the towels and floor mat provide colour; its a very small space w/ no window as well), and sometimes the bedroom, but as long as the clutter is gone and the bed is made, I don’t mind so much. It’s always dark in there anyway. Any ideas? We have stuff on the walls, but it always feels so drab and boring! After two years of the same thing, I am ready for a change! OMG, awesome ideas. I might have to try a few, esp the wallpaper ones! My favorite is the dress turned pillow, and there is a good reason it’s my favorite right now! I am currently wearing an adorable vinatage skirt I found at the thrift store, but it’s a tad tight on my waist, and annoying me. I have been thinking all day how well the design would go in my bedroom as a pillow. Seeing this dress turned pillow made me smile :). I can’t wait to make my new pillow, but am sad to say goodbye to the skirt! in love with ur blog. obviously :) but HAD to stop and say the garden basket idea for storage in the kids’ rooms is GENIUS. love it. This is so rewarding to look at. Your file of DIY ideas has now become my file of DIY ideas. I especially like the shutter turned the coat rack. I think, I’m subscribing to BHG now. Thanks for so much inspiration all on one page! I love the idea of using hanging garden baskets in kids’ rooms. In fact I just added it to my “guide” of Favorite Organizing Products and Decluttering Tips with full credit (and link) to your blog. Keep up the great work! Where do the hanging baskets for the kid’s room come from?